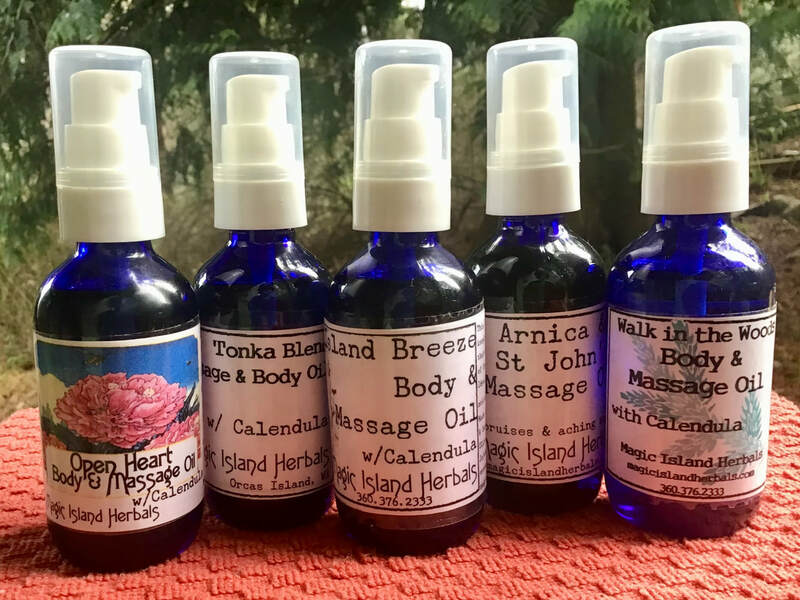 My massage oils are made from a therapeutic blend of Calendula & St John's Wort infused in Olive, Apricot & Almond Oil, Vitamin E, Jojoba & various blends of pure Essential and Fragrance Oils. Great for massage and after bath or shower to moisturize. OPEN HEART- Inspired by dear friends with huge hearts, this is a light clean rose blend. ISLAND BREEZE - A clean blend of floral and citrus. TONKA BLEND - A luscious blend, Tonka is a complex & full scent in the vanilla family, with amber & citrus. ARNICA & SAINT JOHN'S WORT HEATING BLEND - A gentle blend, great on sore, swollen or aching muscles! WALK IN THE WOODS - Inspired by forests andd waterfalls of the Salish Sea.